BBC Sussex announces the return of their Community Heroes Awards for 2018. 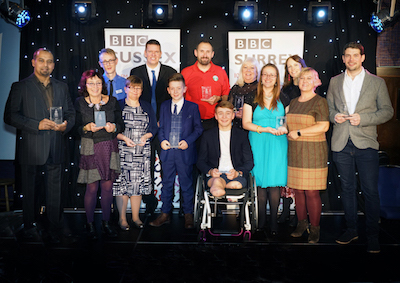 This is the eighth year of these awards, recognising unsung heroes from across Sussex, with entries being sought in a variety of categories, designed to reflect everything from volunteers to young achievers. Interested in making a nomination – or nominations? Tell BBC Sussex who you’d like to suggest and why – in no more than 250 words – remembering to include your name, address and contact number. Entries should then be emailed to: heroes@bbc.co.uk. Alternatively, they can be posted to: BBC Sussex, Broadcasting Centre, 40-42 Queens Road, Brighton, BN1 3XB. All those who make the shortlist will be invited to a special evening of celebration at the Gatwick Crowne Plaza Hotel on Monday 26 November. The overall winners in each category will receive a specially engraved trophy. The event will then be broadcast on the radio.